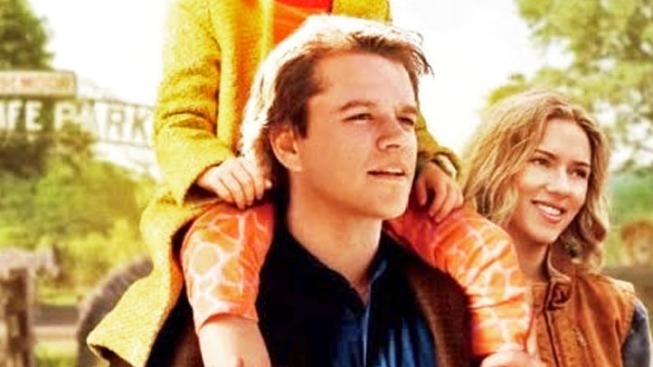 Matt Damon and Cast on "We Bought a Zoo"
This crowd-pleasing, inoffensive charmer from “Jerry Maguire” director Cameron Crowe is sure to make almost everyone happy with its inspiring story, amazing animals, adorable child actor, and the world’s toughest-to-dislike star, Matt Damon. in many ways, “We Bought a Zoo” feels tailor-made for a holiday release when entire families are looking for ways to avoid talking to each other by spending time at the movies. However, if you’re the least bit Grinchy, you'll probably want to avoid touching the unabashedly sweet “Zoo” with a 39 ½ foot pole. Damon stars as Benjamin Mee, a father of two still reeling from the death of his wife six months ago. Desperate for a change, Benjamin uproots teenage son Dylan (Colin Ford) and young daughter Rosie (Maggie Elizabeth Jones, the cutest child actor this side of Jonathan Lipnicki) from the suburbs to a decaying zoo in the country. With zero knowledge about zoos or animals, Benjamin must rely on the zoo’s staff, led by Kelly Foster (Scarlett Johansson, dressed down in plaid flannel and hiking boots) to reopen the zoo. The only villain in sight (other than the massive, mounting food bills for feeding lions, tigers, and bears, oh my) is John Michael Higgins’ smug inspector who is intent on keeping the zoo from opening on time. Instead, Benjamin struggles against his circumstances and his rebellious, mourning son, Dylan. It’s an engaging story that is geared toward inspiration, but the most heart isn’t found in the interactions with the animals or even in the minor romance teased in the trailer between Damon’s Benjamin and Johansson’s Kelly. Instead, it’s the tentative love story between the film’s two young teens, Dylan and Kelly’s cousin Lily (Elle Fanning of “Super Eight”) that provides the film’s best moments. Ford is likable as the oft-confused Dylan, but Fanning is luminous and impossible not to watch. First love is a fragile thing, and Fanning beautifully communicates every high and low. Based on a book by the real Benjamin Mee and his experiences, “We Bought a Zoo” uproots the real-life action from England to a sunny, golden-lit California. Crowe is in his element here, telling a story of a lost man who finds himself (see “Jerry Maguire,” “Elizabethtown,” “Almost Famous,” etc. ), and his journey is set to an amazing soundtrack that should garner more praise than the film itself. Sigur Rós frontman Jónsi composed a gorgeous, joyous score filled with soaring melodies filled with toy piano and bells. “We Bought a Zoo” is unlikely to melt any icy hearts but if you go in with your heart already a little pre-heated, you'll enjoy yourself. "We Bought a Zoo" opens everywhere December 23rd.